In this article, we will be building a Vue.js Application supported by Vuetify and Axios. The aim of this article is to implement a movie application which will be calling on an API. The user will be able to search for movies. 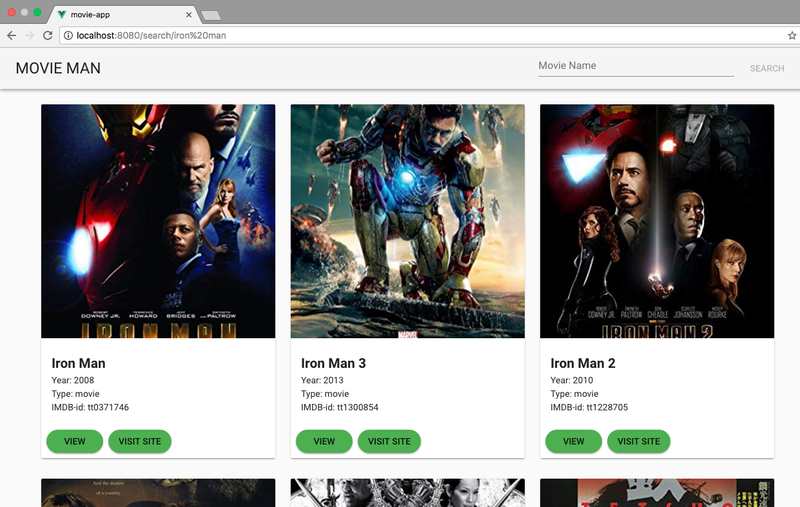 The API will retrieve movies with all the search details. 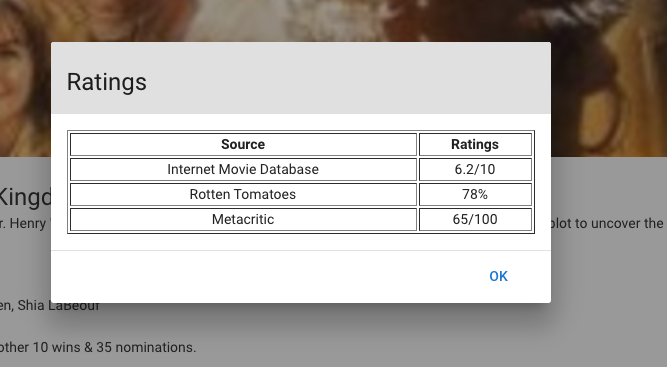 When a user clicks on a movie, it will give more details of each movie. It’s a fairly simple App, but it will explain the use case of calling the API from the Vue.js App. Calling and testing API and Test. 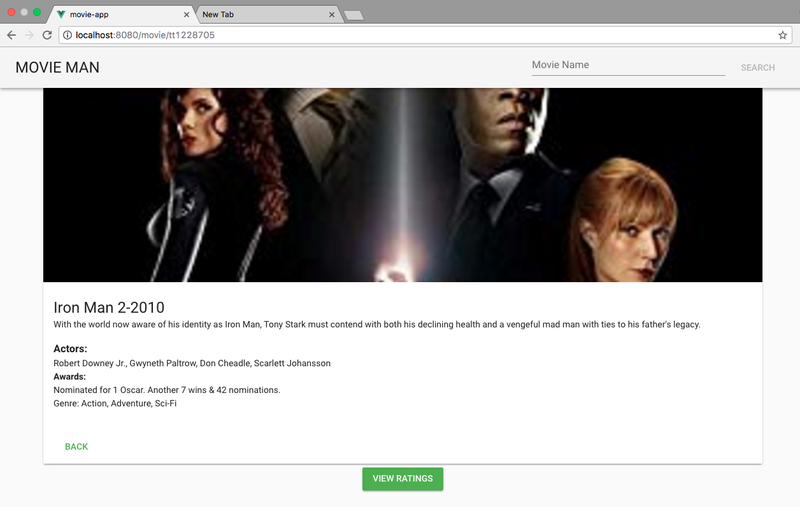 In Vue.js App, we can display the data from an external API. This can be done by vue-resource and axios. Axios is a 3rd part library and it is a popular one. Here is the official link for using Axios with Vue.js. The important point to be noted here is that in the official docs there are no details about installing axios to the Vue.js app. We will cover this in Section 9: Add axios to the project. 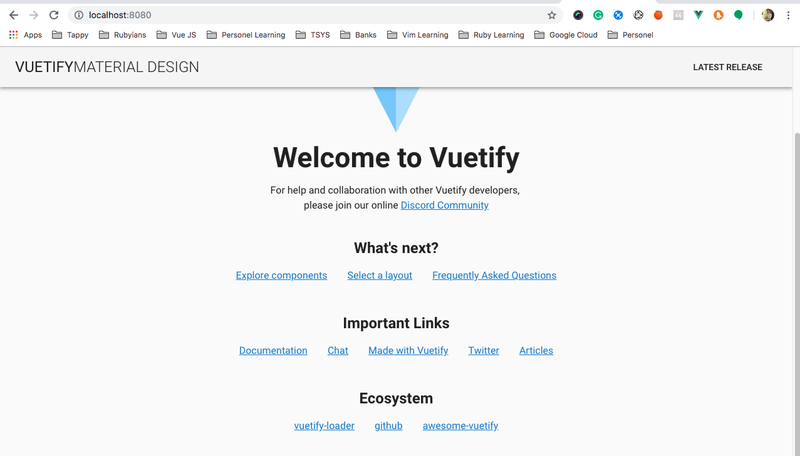 Vuetify is a material design framework built on top of Vue.js. It has nice UI components and which can be readily available to use on Vue.js. The omdbapi is an open and free movie database API which will provide the movie details and images too. The main drawback is that most images are not very clear, but it will do the trick. Also API support is there. In order to use this API, first of all, need to signup and they will provide an API key sent to you via mail. This can be used for each query result. Passing key and also the special string is needed. s stands for search when passing s=”Indiana”, API will retrieve all data contains Indiana. Also, i stands for a movie with imbd id will be returned, so only one is returned since it is unique. We are using “s” and “i” here for the demo. In order to check what we will receive when calling the omdbapi is by testing with postman tool or any API test mechanism. Here I am using the postman for this. Awesome, we are good, now we can proceed to create an app and work on the axios as well. movie-app is our app name. The structure of the app have 3 components. 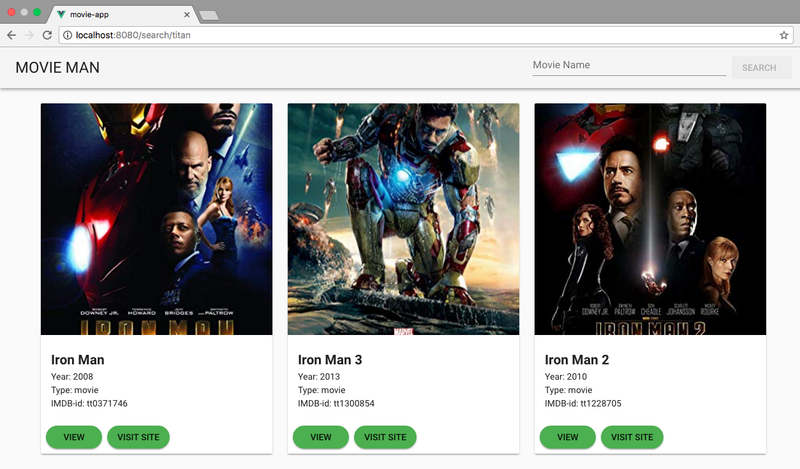 On clicking on each movie, will display details of every single movie, Which can be done by using the Movie component. 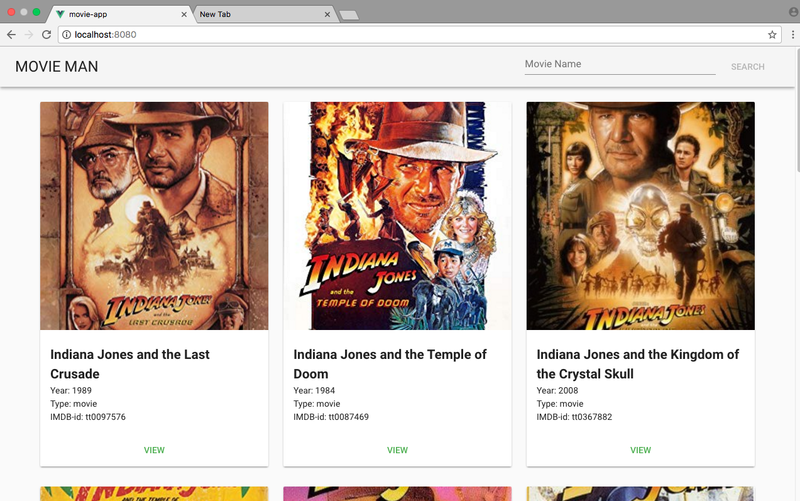 Provided an option to search and display those movies, which can be handled by SearchMovie component. Awesome right, they provide a nav bar also. Then will proceed. now, need to link the router to the application and create a routes file. So far, we created a router/index.js file now need to import the Vue instance and vue-router to that file also, need to export the default router file. Each router path will have 3 components: path, name, component. Axios is our point of contact to call the API services in this app. Now we need to install axios to our project. By default, we are having a component in place, will remove that and will create the components we needed. HelloWorld.vue is the default component, will remove that from our app. Add the axios to the LatestMovie component. Link the router to LatestMovie. Add a progress bar for LatestMovie. Create a file called LatestMovie.vue in components folder. 2. Add the axios to the LatestMovie component. Here, we are using the mounted() life cycle for this, added the code to get the result from the omdbapi with the indiana movie data. 3. Link the router to LatestMovie. Now, we need to link the LatestMovie to the router file. If the API will take time to retrieve, we will need to display a progress bar. This can be achieved by using the “ <v-progress-circular” from vuetify. Created a data property which will be set to true initially, then after the API response will be set to false. Also another data property called wholeResponse will take care of the data. Now, it is the time for the single movie part. 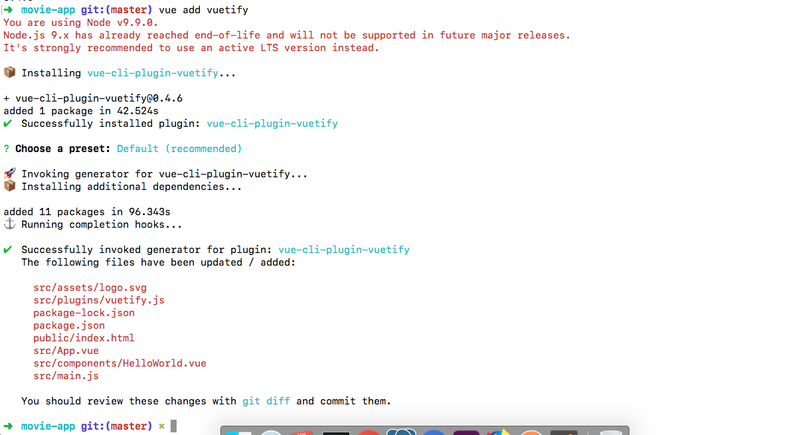 This can be achieved by using the Movie.vue file. Pass the props in a router. Pass the props in latest component. Work on the props data in the movie component. We are giving props: true because we are passing the imdb_id to the Movie.vue component then that value is used to call the API for that single movie. Now up on clicking on the view in the LatestMovie, will call the method which will, in turn, pass the imdb_id as a props to the Movie.vue. Also, added a data property called singleMovie to handle the response. For that, will display using a modal, which will be invoked on clicking the view rating button. We are iterating a data value called ratings. This data property is from a response from API ie response.data.Ratings. Create a text field in the App.vue. On clicking the search button, will pass the data from the text field to the SearchMovie.vue file as prop. 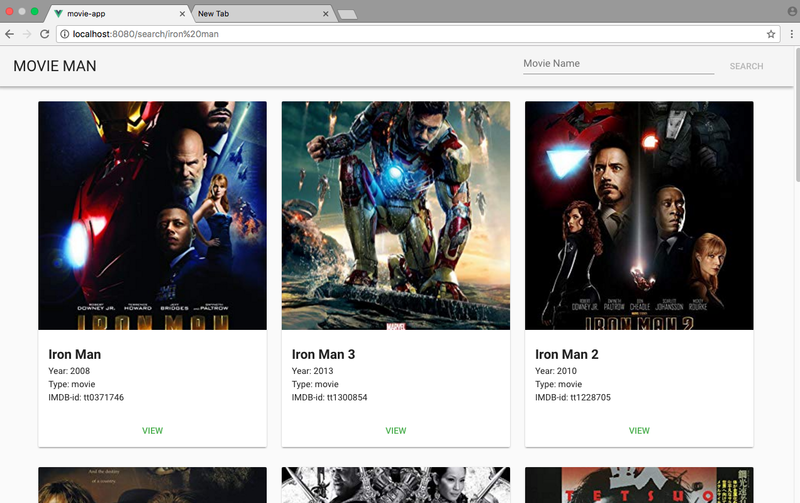 In SearchMovie.vue file, we will receive the value and call the API to get the data. Currently mounted lifecycle hook is called only one time, when we search for one time, it displays the data, ie when searched with iron man, it shows the data. but After searching with “titan”, It shows the same data. This can be fixed by using the watch property on the props of the data called name(from the App.vue) and updated the mounted property as a method. As a result, the system will call 2 times, ie when the first loaded by the mounted lifecycle hook and again search will be handled by the watcher action for the props(name) value. Suppose, when we are calling for the API with invalid movie or movie that is not available in our omdbapi . In that case, need to display a message. We are creating a data property by default which is false, when searched data is not returning anything, will set as true and it will display the message. Still, our axios and API calling codes are scattered everywhere in the component. It will good if we place those all in a single place like services in angular. Import the MovieApi.js in the components. 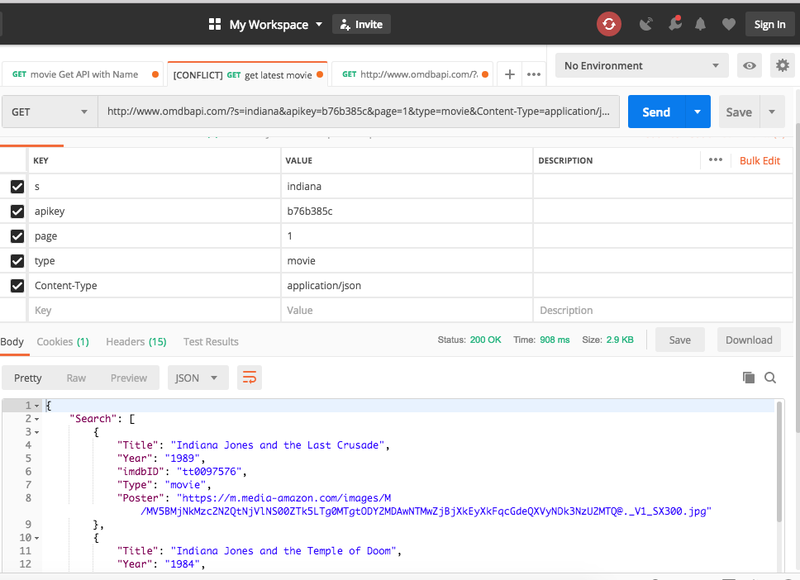 Remove the axios code from the components and place in the MovieApi.js file. Call the appropriate methods from components. I hope you have enjoyed following along. Please leave claps and comments if you liked the content and would like to discuss further!